EmergPrep Disaster Survival Do It Yourself Guide – Preparation is Your Key to Survival in 2013! In today’s unpredictable world, we cannot know when or where we may face an emergency or disaster. Our team has prepared this Do It Yourself EmergPrep Disaster Survival Guide, to help you review the key issues, and prepare a customized survival plan for your unique situation, whether its for your home, your cottage, your office or car. We provide details on the supplies you need to survive for at the first 72 hours. Emergency Preparedness Now … Preparation is Your Key to Survival, provides Emergency Preparedness Services and Supplies for all kinds of emergencies and disasters including hurricane, storms(snow,rain,ice), earthquakes, pandemics, providing expert advice on the how to prepare for the eventual emergencies that happen to us all, whether in your home, office or car, we all need to plan and prepare. Get Started Now with our Emergency Preparedness Disaster Survival Guide, a guide to get started planning for Survival including a risk assessment, personal emergency plan preparation, and selection the the perfect set of supplies for your situation. Remember … Preparation is Your Key to Survival!. BUY now, only $19.95 (Special, for a limited time, reduced from $34.95) includes appropriate taxes! We also offer a FULL SERVICE PACKAGE, including stocking and re-supply of perishables on a scheduled basis (as recommended 6, 12, 18 month cycle), so when you need them, you’ll have what you need. Consider Getting Started Now with our Executive Emergency Preparedness Package, a complete system, starting with a detailed risk assessment, personal emergency plan preparation, and selection the the perfect set of supplies for your situation. Remember … Preparation is Your Key to Survival!. Order now, only $3495.00 includes appropriate taxes! 3 Days, 3 Ways … That’s the Challenge. You need a plan to survive 3 days without assistance during an disaster. Only 72 hours … That’s the Challenge! Can you do it? Family Safety, Security, and Survival preparedness needs to be addressed in the majority of homes. According to a recent survey, few of us prepare properly for the eventual emergency crisis situation. In a recent survey on Emergency Preparedness, conducted for our Government Health Agency, dated June 2010, almost 60% said that neither they nor their family have purchased or prepared an emergency kit with supplies they might need in case of an emergency. Have you prepared a survival plan? Where do you place yourself? So, why would you need a plan now? Have you seen the news lately, Extreme Weather Conditions, Extreme rain events, Tornados, Earthquakes, Electrical System Failures! All the type of conditions that you need to be prepared for. We all can do better! We all should do better! EmergPrep – Be Better Prepared to SurviveTM Program can help you. For more information Click here to check it out Family Safety, Security, and Survival Program! Family Safety, Security, and Survival, is usually on the top our minds. I don’t know about you, but as a family person, my Families Safety, Security and Survival has always been at the forefront of my mind. We all strive to provide a safe and secure environment for our children to grow up in, and yet, according to a recent survey, few of us prepare properly for the eventual emergency crisis situation. We all can do better! We all should do better! In a recent survey on Emergency Preparedness, conducted for our Government Health Agency, dated June 2010, a majority of respondents (59%) said that neither they nor their family have prepared a family emergency plan that includes how to get in touch with each other in case of an emergency. Have you prepared a plan? Where do you place yourself? Have you seen the news lately, Extreme Weather Conditions, Earthquakes, Electrical System Failures! All the type of conditions that you need to be prepared for. Be Proactive, one of your keys to surviving in a crisis or emergency. So, when it come to surviving, it is important to be proactive. Take action today, get a plan started with our help. We look forward to hearing from you. Sign up for our updates, and be Proactive!! Who is our emergency point of contact? Choose an out-of-town friend or relative to be your contact. During emergencies, it’s often easier to make long distance calls. An out-of-town person can help communicate among separated family members. Where are our meeting places? In case you can’t return home, choose a place to meet in your neighborhood and another place outside your neighborhood if you can’t get there. Your neighborhood meeting place may be a friend’s house on the next street. A meeting place outside your neighborhood may be a nearby church, store or another friend’s home. Do our schools have emergency plans? If you are a parent, ask your schools and daycare providers about their emergency plans. Find out how they will communicate with families during a crisis. Ask if they are prepared to stay in school if necessary and where they plan to go if they must leave. If power goes out and you have no heat: You’ll need blankets or sleeping bags for warmth in as few as four hours after power is out, depending on your home’s insulation. Dress in several layers of loose-fitting, lightweight clothing, and wear a hat and mittens. If you use kerosene or propane heaters: These should be used with much caution. The room must be ventilated by opening a window. Keep heaters at least three feet away from flammable objects such as curtains, blankets and furniture. Place heaters on a hard surface, not on carpet. Refuel them outdoors after they have cooled. If the power is out and you need information: Be sure you have a battery powered radio with extra batteries. Get one with a weather radio band so you can hear reports from the National Weather Service and your local radio stations. Find these at electronics and sporting goods stores, department stores, from catalogs and on-line. If you must drive during a winter storm: Most traffic crashes happen within two hours after a storm starts. Try to stay off the road to give snowplows time and space to work. Wait until daylight to drive so sunlight can warm the roads. Get road conditions. Buckle up every time you drive. How do you go about getting ready. First step is to look at the risks you face. The better you are at seeing the full range of risks, the better your plans will be. A risk assessment is part of educating yourself about emergency preparedness. •	Unless you know the hazards most likely to affect you, and the consequences of those hazards, you cannot form an effective plan. •	Thorough preparation saves lives, minimizes injuries, and can save you time and money. Carbon Monoxide is odorless, colorless, and tasteless, a real silent killer. Survival and Safety are big issues. The big problem, is that you can be accidentally poisoned, you may not know it until it is too late, possibly while you sleep. Carbon Monoxide, results from furnace combustion, and is Winter’s Silent Killer. 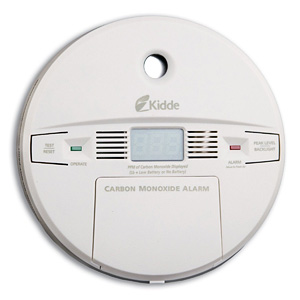 Carbon monoxide is produced when a fuel such as gas, oil, kerosene, or wood is burned. When the flue gas leaks into your residence, you can be accidentally poisoned, you may not know it until it is too late, possibly while you sleep. A poor burn or improper ventilation will build up a high concentration in the home. Carbon Monoxide in high enough concentrations, starves the oxygen from bodily tissues, which could lead to seizure, coma, and fatality. Preliminary symptoms are flu-like and include headache, nausea, vomiting, dizziness, fatigue, and weakness. It is said that about 500 people die each year in the US from accidental carbon monoxide poisoning while thousands require emergency treatment. The Key to Safety and Survival, is be prepared, get yourself a Carbon Monoxide Detector.